Does Islam teach to hate and kill Jews and Christians? It is totally false that Muslims hate Jews. The Quran addresses the Jews as people of the book. 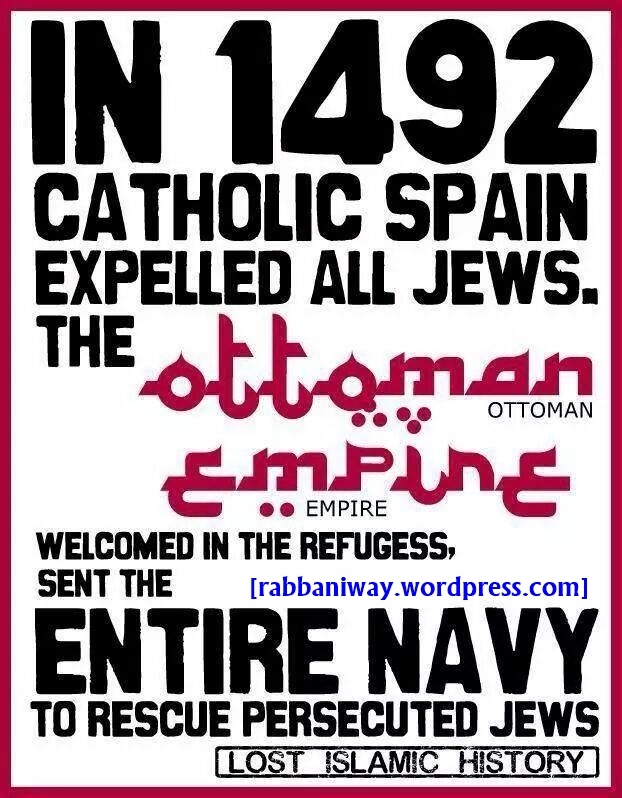 The Jews used to see the Muslims as liberators from the oppressors in Europe. However, Muslims find the actions and idealogy of the Zionist state abhorrent. How evil it is that the Zionist who claim to speak for Jews, are killing and stealing from the very people who liberated them. We are anti Zionist not anti Semetic. The Zionists are the real racists, who don’t only claim superiority over the Muslims who are Arabs, but they also claim superiority over the Jews who are black. WHAT DOES ISLAM SAY ABOUT CHRISTIANS AND JEWS (PEOPLE OF THE BOOK-AHL AL KITAAB)? 3:113 Not all of them are alike: Of the People of the Book are a portion that stand (For the right): They rehearse the Signs of Allah all night long, and they prostrate themselves in adoration. 3:114 They believe in Allah and the Last Day; they enjoin what is right, and forbid what is wrong; and they hasten (in emulation) in (all) good works: They are in the ranks of the righteous. Muslims are therefore allowed to marry Jews and Christians and to keep good relations with him. But as Muslims do not keep friendship false deviant sects with in Islam, Muslims also do not keep close friendship with those Christians and Jews who contradict the verse 114. 1400 Years ago Prophet (peace be upon him) foretold the events of the end of times. One of which the Muslim fight against Jews(Zionist) and Muslim gaining victory over them! You must know that Zionist movement began only 70 -80years ago and Israel was created then only! This is from one of the spiritual knowledge of the unseen of the Prophet Muhammad (alaihiswalathu wa salam). But so many fools believe that it is the terrorist groups who fight Jews are on the right course!, But this terrorists are obviously the part of Anti-Christ (Masih Dajjal)!. Terrorists and Zionists are the rebellious sinners who think they themselves are Mahdi and Messiah and taking the action before Mahdi and Messiah comes! When worst people take action on best and most important affairs,they create big problems and tribulations to everyone. They are the immature people, guilty and corrupted, and they are doing all this out of panic and ignorance. They will be defeated at the end by Mahdi (A.S) and Messiah (A.S)! So, we must patiently wait and pray for Mahdi (A.S) and Messiah (A.S) to come forth! Because the Army that fight in the end of times, will be spiritual men, who have spiritual wisdom to hear the whisper,speech and vibration of the trees and stones in regard to spiritual knowledge!This spiritual men will be handful who comes forth for Imam Mahdi (A.S) and Messiah (A.S). This about when certain Jews in power who corrupt and spread anarchy in Muslim world, end of it, the Noble Muslim army lead by Mahdi (A.S) would bring the disorder into an end, and they will be war between Muslims and Zionist Army! It never mean that Muslims always has to kill or have enmity to innocent unarmed and peaceful Jews. If that was the case that Muslim must kill Jews, then there would not have any Jews left in this world, in the time of Caliphates which ruled 1300 years in the Middle east!, None of them wen to slaughter Jews! Ibn ‘Umar reported Allah’s Messenger (may peace be upon him) as saying: You will fight against the Jews and you will kill them until even a stone would say: Come here, Muslim, there is a Jew (hiding himself behind me) ; kill him. Abu Huraira reported Allah’s Messenger (may peace be upon him) as saying: The last hour would not come unless the Muslims will fight against the Jews and the Muslims would kill them until the Jews would hide themselves behind a stone or a tree and a stone or a tree would say: Muslim, or the servant of Allah, there is a Jew behind me; come and kill him; but the tree Gharqad would not say, for it is the tree of the Jews. Abdullah b. ‘Umar reported Allah’s Messenger (may peace be upon him) as saying: You and the Jews would fight against one another until a stone would say: Muslim, here is a Jew behind me; come and kill him. Allah’s Messenger (saws) bought some foodstuff (barley) from a Jew on credit and mortgaged his iron armor to him. Allah’s Messenger (saws) died while his (iron) armor was mortgaged to a Jew for thirty ‘Sa’s’ of barley. Today You are abusing Prophet Muhammad by looking at the deeds of today’s Muslims, how foolish you are! Learn Islam from Prophet Muhammad (Peace be up on him and his family). Don’t learn Islam from 20-21st century minority extremist people! You saying Quran has this verse and that verse. But Quran is revealed to Prophet Muhammad (peace be up on him) and who knows Quran better than Prophet? So listen to the words of Prophet Muhammad (peace be up on him) to whom Quran is revealed, by him Quran is taught and interpreted. Don’t take verses about War laws and war time verses to use against Islam to prove Islam want to destroy other people and religions in peace time! Islam forbid killing women,children,old age and pregnant , unarmed etc during war time! This is the time of lawlessness! no one follows Quran and Tradition of Prophet (peace be up on him) but they follow some wicked people who are a very minority among Muslims!